The unseasonably cool weather has me back in a comfort food mood. Meat and potatoes are exactly what I am looking for. But not just any meat and potatoes. How about a thick and rich pork stew? As per usual I have about 30 minutes to get dinner on the table. With my 3 year old Munchkin at my heals and some funky 70's tunes jammin' in the kitchen, we are cooking with Crisco (well maybe more like extra virgin olive oil, but that doesn't sound as cool). We love to sing and dance in the kitchen. Which takes my back to my childhood, hearing my daddy belt out "Cara Mia" as he would prepare dinner. Well for us, it was a really interesting rendition of YMCA and You Make Me Feel Like Dancing and then back to work. Now that dinner is already making me feel at home, I decided to make this extra special for Chad. A fabulous midwestern style pork stew with an amazing depth of flavor from... beer. Yes, you heard right. It is absolutely amazing and it imparts an amazing flavor. Unsure about the beer? Trust me it doesn't taste like beer at all. I use the same rule of thumb with beer as I do wine. I use something that I would drink. You can also replace the beer with another liquid or just use chicken broth. 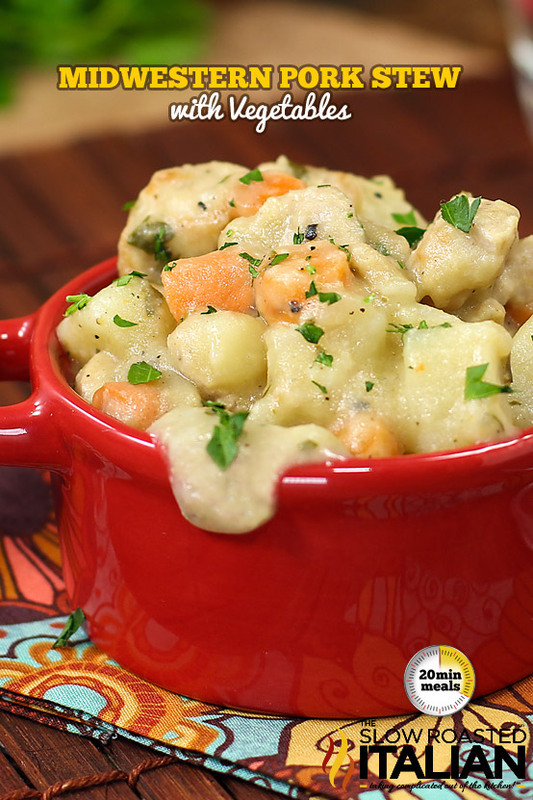 Check out these delicious stews to finish off your cool season! Click on the link or the photo to open in a new window. 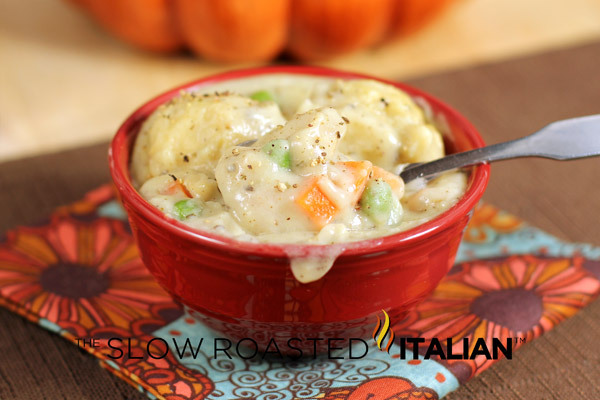 Simple Crock Pot Chicken Dumplings is easy as can be and so homemade it may transport you back to your moms kitchen table. Just like moms. 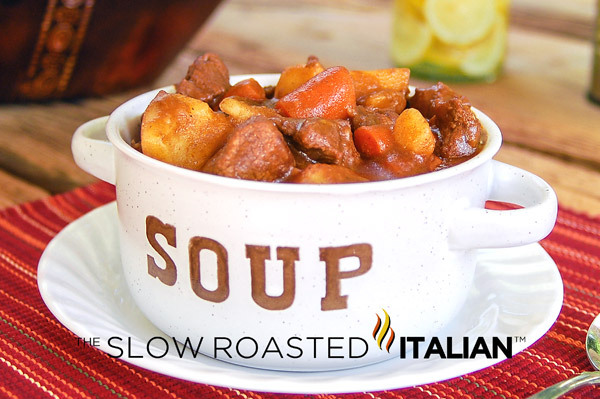 Nana's Hearty Beef Stew is a family recipe with a secret ingredient to really make the flavors POP! 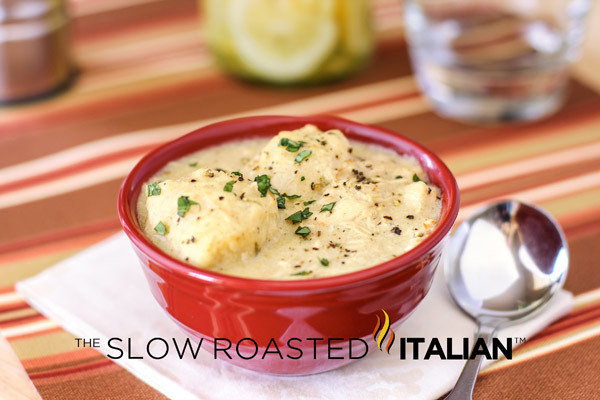 How does a thick and creamy Chicken and Dumplings done in 30 minutes sound? No, its not a dream and no canned soup! Warm a large skillet or braising pan over medium-high heat. Combine ¼ cup flour, ½ teaspoon salt and ½ teaspoon pepper in a gallon resealable plastic bag. Dice pork into bite size pieces. Add pork to resealable bag. Add oil to skillet. Gently add pork to skillet. Brown pork on all sides. Meanwhile, prep potatoes and carrots by dicing into small bite sized pieces. Add vegetables to skillet. Stir to combine. Pour beer in skillet. Cover. Add water, chicken base, onion powder, garlic powder, and sage. Stir to combine. Cover. Combine melted butter and 2 tablespoons flour in a small bowl. Mix until mixture is smooth. Add to skillet. Stir to combine. Reduce heat to simmer. Cover. After 10 minutes of simmer, remove from heat. That pork stew looks amazeballs - I love Blue Moon too - probably my favorite beer, but I don't drink it all the time. Pork stew meat is almost always on sale at my store for 1.99 a pound. I'll have to give this one a try! Kapow! I have to make this. I love the flavor that beer brings to stews and soups. It's not what people might assume. It takes on a different character, don't you think? I can't wait to try your pork stew as it is so different from what I usually prepare. Perfect for the weather right now. I would try it. Just make sure they are cooked through and if they are not tender enough, let the stew simmer a bit longer. Enjoy. Let us know how it goes. I put it all in a slow cooker before we went to church this morning. Came home and it smelled DELISH! I took a little taste and it WAS!! It's hubby's birthday today, so we're going to take a walk in the park with the kids. Can't wait to come back home and eat! Thanks again! I am guessing that when you say chicken base you mean "stock"??? These recipies look fab and I can't wait to try some of them out! Actually chicken base. You could substitute 3 low sodium chicken bouillon cubes or sub 2 cups of chicken stock for the 2 cups water and the 1 tablespoon chicken base. Enjoy and let us know how it goes. Do you have a recipe for stew using chunked up pork tenderloin? I do not. 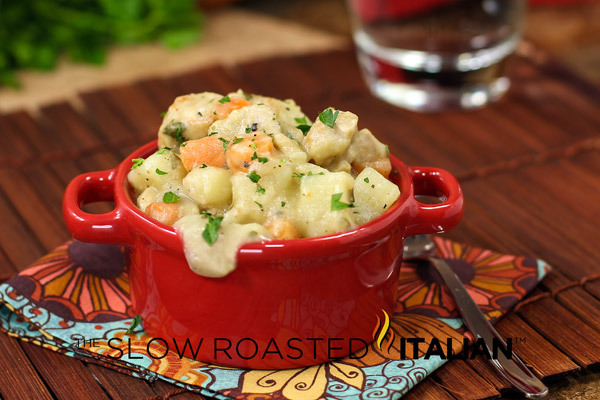 Stew does best with shoulder, but you could substitute it in just about any recipe and make sure you cook it long and slow. Enjoy and let us know how it goes. I have left over grilled pork chops, do you think I could use them in this recipe? Cooking this right now and it smells amazing! Can't wait til it's done! Awesome!! Enjoy and let us know how it goes! Yum! I want to make this! Can something else be substituted for the beer?